The true key to success is to start RIGHT NOW, because there’s no magic ‘I’m ready’ day! Seriously, there is no day you will completely feel ready! You just have to dive in and make it happen. We know you have goals in your head you are looking to hit? We all dream about goals that we feel we “should” be able to achieve, but we push them off for another time, fearing we just aren’t READY yet! Wonderful goals like one day I’ll do a 5k… or I plan to join the gym….or I am going to spend some time doing something for me. …. Or start a book …. Or maybe travel to another country. One of our FAVORITE and we mean favorite quotes came from the incredible Michael Jordan. This has always struck a cord with us, because this is also 100% true! Michael Jordan was THE best at his craft and he only made about 50% or less of his shots! Let that one sink in for how you approach life. Let’s take a subject we have 100% passion for – exercise. If you wait for the conditions to be perfect – ie: your kids not needing you anymore to cart them around, your kids to be napping while you workout, a gym that is closer, a little more motivation, to lose 10 lbs before you start, or anything in between – you are going to miss 99% of your chances to just show up and MOVE that body! Even showing up for 2-3 workouts a week, will translate into 100-150 PER YEAR! Are you working out that much right now? It’s not a hard number to reach, but most out there feel if they can’t work out 5-7 days a week, why bother. If you are waiting until you are “ready”, before you know it, weeks, months and possibly years have gone by and because you didn’t think you were “ready”, you now have a much bigger mountain to scale. Although it sounds promising, proper maybe, ready can oftentimes mask hesitation and a lack of a plan. You don’t know what to do (which is A OK to admit), and so you do what you know how to – nothing at all. If you have a body, a heart and a brain that is alive and working then YOU ARE READY! You just need to find your tribe, to show up and to TRY! // If it is reading a book, find a group book club out there and sign yourself up. In person, or virtual. Our members started their own book club, most of them having never met each other before, but sharing a common bond of VFit. One member brought it up, and others jumped on board. It was that easy. // If it is running a race, find a race that looks fun! Don’t go sign up for a marathon if you have never been a runner, you may find you don’t even enjoy running and that’s ok too (90% of our trainers actually hate running!). Find a 5k, sign up, print up a training schedule and start! // If it’s getting back in shape and feeling good about YOU again, this is one we are experts at. So go back to last week’s inspo, shut that negative voice up in your head that is doing you no good, sign up for a fitness class and SHOW UP! 99% of us cannot do it alone – don’t beat yourself up for that. As humans we were built to be part of a team and around others. So join a group! Hire a personal trainer! 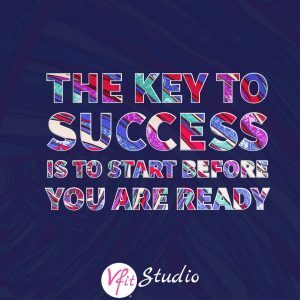 Join VFit! MAKE YOURSELF accountable and by golly, just start! 1 minute is fine if that’s all you make it. But if you want to make things happen in this short life we are given, just make it happen and start now! There’s no magic I’m ready day to get there and make your plans a success. What kind of goals do you have that you’ve been waiting for? What can do you TODAY to just START and work to make it happen? We bet, even for the loftiest of goals, there’s ONE THING you can do right after reading this to head over to Successville, population YOU. We sincerely hope this post right here is what you look back on and remember as the (nice) kick in the pants you needed to reach you goals and find success in something you have been wishing for for yourself!